Megan Abbott is a literary force to be reckoned with. Deftly blurring the lines between contemporary fiction and the mystery genre, she leads readers through labyrinthine twists and turns of plot with utterly beautiful and emotionally devastating prose. Her latest novel, You Will Know Me, is no exception to her unique style. Abbott has a knack for overturning familiar facets of the American dream, revealing a world of dark and ugly secrets that lurk beneath even the most respectable veneers. Much as with her 2012 novel Dare Me, in which she delved into the world of cheerleaders, she now sets her tale among another competitive activity: the world of girls’ gymnastics. Katie Knox is the proud mother of the astonishingly talented Devon, who has proven to be something of a prodigy in the years following a severe foot injury. Along with several other proud parents of the gymnastic team, Katie is looking forward to a likely Olympic future for her daughter. Tragedy strikes, however, when a charming young man named Ryan Beck is killed in a hit-and-run. Ryan’s death causes grief for more than just his girlfriend and family, however. Questions and revelations raised in the wake of his death quickly send ripples through the whole community, and begin to tear even the strongest friendships and relationships apart. Shortly after, Katie’s son Drew falls ill with scarlet fever, and that unto itself drives a wedge even more deeply into the Knox family. Drew tries to keep herself isolated from him as her health is absolutely vital to her gymnastic career. Katie’s husband, Eric, becomes increasingly more distant, and Katie herself is left struggling to hold everyone and everything together. Meanwhile, Katie herself becomes increasingly invested in Ryan’s death. For every stated and seemingly obvious factor, there seems to be a mysterious clue lurking in the shadows; and the deeper into her private investigation she goes, the darker and more twisted the mystery becomes. The book’s official synopsis is somewhat misleading, in that it emphasizes Katie as having “to consider whether there isn’t any price she isn’t willing to pay to achieve Devon’s dream.” While she is fiercely protective of her daughter, Katie does not devolve into some kind of murderous, vengeful figure. Instead, she is faced with many hard truths about her friends and her family, and even harder decisions about what to do. Although the prose is told with a third-person limited point of view of Katie’s journey through this tale, the entire cast of characters is every bit as vividly portrayed. They make mistakes, they say and do hurtful and sometimes absolutely terrible things, and often reveal very ugly thoughts. And above all else, they hold secrets from one another—which forms the very skeleton of this story. There is a scene in which Katie reluctantly gets into a fairly uncomfortable, yet deeply touching, conversation with her son Drew about Ryan’s death as they are setting the table for dinner. To share too much more about this amazing novel would be a grave injustice to its plot. Coupled with its rich prose and vividly, painfully realized characters, this is very much a mystery novel, with a host of jarring twists and turns that would impress even the most jaded reader. 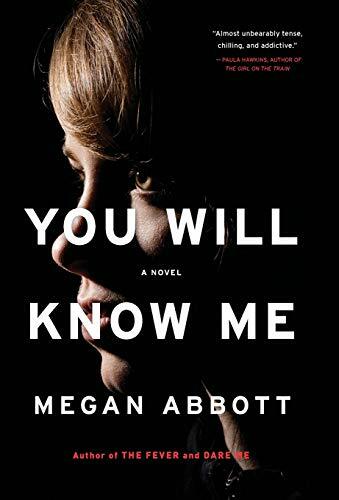 You Will Know Me is the kind of tense, haunting tale that only Megan Abbott could tell, and once again cements her place as one of the most talented storytellers currently working in any genre.